I'm on to book three of the Charles Dickens Challenge, and this time it's Nicholas Nickleby. The book tells the story of the eponymous Nicholas, who is blackmailed into finding work by his money-grasping uncle Ralph after the death of his father. Initially sent to work at a Yorkshire boarding school run by the avaricious and cruel Squeers family, Nicholas's hot temper gets the better of him one day and, accompanied by the school's drudge Smike, he returns to London, determined to make his fortune as an independent man. From the off this is a much lighter tale than Dickens' previous novel, Oliver Twist. It's much closer to The Pickwick Papers in terms of its episodic style as Nicholas jumps from job to job in the hope of earning enough to support his mother and sister Kate. There were further echoes of TPP in the relationship between Nicholas and Smike, a drudge at the school who escapes and accompanies Nicholas on his return to London. Smike's unwavering devotion to Nicholas put me very much in mind of Sam in The Pickwick Papers and his relationship with Mr Pickwick. 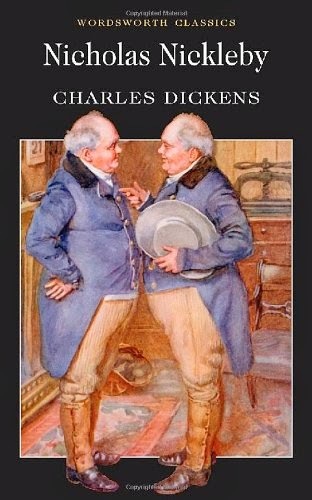 There are also many more comedic characters in Nicholas Nickleby than there are in Oliver Twist - even the Squeers family, who are amongst some of literature's most odious creations, are particularly ridiculous in terms of their relationships with each other, from the lovey-dovey romance between Mr and Mrs Squeers to their daughter Fanny's over-the-top flirting and fainting when she convinces herself she and Nicholas are in love. That said, there is overlap with Oliver Twist as well, specifically in the Dotheboys Hall sequences which have very strong echoes of the earlier book's workhouse scenes. I'm also struck by the similarities between the depiction of Dotheboys Hall, the school Nicholas teaches at in the early part of the novel, and of Lowood, the Yorkshire boarding school Jane Eyre attends. I can't find anything to say that Charlotte Bronte took any influence from Dickens (Nicholas Nickleby was published eight years before Jane Eyre) but it's certainly possible she may have read his work and the thought may have lingered in the back of her mind. In terms of influences on Dickens' later work, Ralph Nickleby seems to be something of a model for Ebeneezer Scrooge - both of them care more about hanging onto every last penny than helping people in need, even their own family. What is different, however, is their nephews' reactions; where Fred Scrooge keeps trying to build bridges with his uncle, Nicholas is bettered by his hot temper and swears to have no dealings with Ralph after his ill treatment of his mother and sister. Dickens also develops his ability to write a tragic death well. I won't spoil it but there's a particularly famous death scene in his next book, The Old Curiosity Shop, and you can definitely see the trial run he took at doing that in Nicholas Nickleby. Nicholas Nickleby also has the most brilliant cast of supporting characters, from Sir Mulberry Hawk's henchmen Mr Pluck and Mr Pyke, who are to Mr and Madame Mantalini, owners of the milliners where Nicholas' sister Kate works early in the novel. Mr Mantalini in particular was a favourite of mine for his various pet names for his wife - 'my essential juice of pineapple' is one of the many highlights. Overall, I enjoyed Nicholas Nickleby a lot more than Oliver Twist, because there seemed to be a lot more light and shade in the characters - although Nicholas in particular will have points when he gets on your nerves - and a slightly more humorous tone overall. There's also good development from The Pickwick Papers; it retains the episodic structure but equally feels much more like a coherent plot than the previous novel, and has a similar ending with everyone paired up but also feels less shoehorned in as the romantic relationships are introduced earlier on. I'd definitely say this is my favourite from the challenge so far. Have you ever set yourself a challenge to read an author's complete works or a full book series - and if so, what was it?